The new Iron Ridge Railroad (merger between the Western Valley and Iron Ridge Railroads)is proud to be Member #25 of the North American Rail Alliance. Feel free to click on the logo to find out more. The original WV was built in 1996, its orange and black diesels leading freight to other parts of the world. Unfortunately, with a shortage of money, the line wasn't reaching its full potential, and eventually, the WV was forced to shut down. The time that passed created havoc on the track, ripping up portions of mainline. 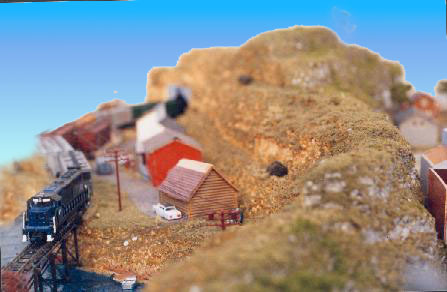 When Reality Scaled, a free-lanced modelmaking company, built a new complex in Alanda, it needed rail service to ship its models out and bring raw materials in. This lead to the creation of a new WV. Reality Scaled rebuilt the entire mainline, bought two ex-Burlington Northern GP-35 diesels, and added passenger service from Krystal Lake to Alanda. Now, with proper funding, the tiny railroad once again rises to glory in a fairy tale story of miracles. Plans are already in the works to expand the mainline from Alanda, reaching out, making the WV a profitable short line giant. Although it continued to profit, the Western Valley couldn't succeed on it's own due to circumstances beyond it's control. After shutting down the line for 9 months in 2000-2001 it finally gave in to pressure from it's officials and merged with the newly formed Iron Ridge Railroad. Saddened by the merger, CEO Ed Burchell offically disbanded the Western Valley name and adopted the Iron Ridge name. Click on the above logo to visit the new Iron Ridge Railroad.